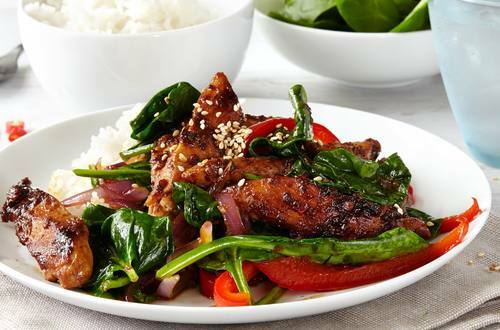 Tasty chicken teriyaki recipe with hints of finely grated ginger and apple juice. Hellmann's® or Best Foods® Real Mayonnaise gives the juicy chicken a smooth, creamy texture. 1 Bring apple juice, soy sauce, ginger, brown sugar, garlic and chile pepper to a boil in medium saucepan, stirring occasionally, until liquid is reduced by half, about 5 minutes. Set aside. 2 Combine Hellmann's® or Best Foods® Real Mayonnaise with 1/2 of the apple juice mixture in medium non-aluminum bowl or shallow baking dish. Reserve remaining apple juice mixture. Stir in chicken. Cover and marinate in refrigerator, stirring occasionally, about 4 hours. 3 Remove chicken from marinade, discarding marinade. Heat oil in large non-stick skillet and cook chicken, red bell pepper and red onion, over medium-high heat, stirring occasionally, until chicken is thoroughly cooked, about 5 minutes. Remove chicken and vegetables to serving dish and keep warm. 4 Heat reserved apple juice mixture in medium skillet and cook spinach, stirring occasionally, just until wilted, about 3 minutes. Pour spinach mixture over chicken. Sprinkle, if desired, with toasted sesame seeds.